While the school year officially starts between late August and early September, government-run schools in British Columbia are presently closed due to an ongoing teachers’ strike. That strike occurs at a time when provincial and local governments need to reduce excessive spending and accumulated debt. It is uncertain how much longer interest rates that make it easy for governments to borrow money will remain at below-market levels before political and economic events occurring overseas affect the world’s reserve currency and cause interest rates to rise. During an earlier period, government schools and their teachers held a virtual monopoly on offering education in language skills, numerical skills, physical and social sciences. The advent of information technology has greatly increased people’s access to a wide range of educational programs. Consumer dissatisfaction with government schooling is occurring internationally, with the result that parents of even meagre means are seeking to send their children to private schools. 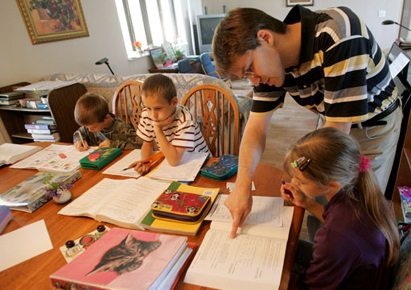 Other parents have chosen to educate their children at home, often forming liaisons with other similar homeschooling families to form support networks. Documentaries broadcast on television often become available for sale to the general public on CDs, with a range of subjects that includes nature and wild life programs, science programs and history documentaries that often duplicate the content of subjects offered in public and private schools. However, the documentary approach simultaneously entertains and educates without commercials and without the interruptions and distractions that normally occur in classrooms. Market economics requires producers of documentaries to attract a voluntary viewing audience with quality products. Successful producers seek to inspire viewers with the joy of learning new material. Successful homeschooling depends on sustaining the joy of learning in a learner-paced environment that is absent in government schools. When governments held a near-monopoly on educational services, teachers’ strikes would motivate parents to pressure elected officials to resolve disputes with teachers’ unions. Present-day teachers’ strikes, on the other hand, could motivate a certain percentage of concerned parents to investigate alternative educational options for their children, such as the Sal Khan Academy that provides online, learner-paced tutorials on mathematics and the physical sciences to mainly pre-teen learners. The existence of such easily accessible programs eases the educational challenge for homeschooling parents. Televised news broadcasts from British Columbia have shown parents of mainly younger children organizing to provide a semblance of education. A prolonged strike runs the risk of parent networks accessing a wide range of alternative educational options suitable for a homeschooling environment. As a result, more children may experience the joy of learning in an environment free from the turmoil that occurs in government schools. Peer bullying occurs in the majority of government schools, where anti-bullying programs such as zero tolerance have failed on a massive scale. School bullying has forced many parents to transfer children to other schools, but bullies from different schools actually communicate with each other via social media. As a result, the bullying follows the target, despite having changed schools. Government officials avoid addressing the root cause of school bullying, it being a symptom of a problem with the school system itself as well as the result of the misguided government social, welfare, minimum wage policies and labour laws of an earlier period. A teachers’ strike keeps many students away from an emotional unhealthy environment. A teachers’ strike during an era of electronic telecommunications puts the easy availability of alternative educational programs in stark relief to government social policies that achieve the exact opposite over the long term of their ostensible intention. While teachers’ unions seek to achieve more benefits for teachers, they also oppose homeschooling and support compulsory school attendance laws, along with labour and minimum wage laws that exclude most teenagers from employment opportunities. Such policies ultimately underlie the epidemic of disruptive behaviour and bullying in government schools. A prolonged teachers’ strike compels parents to form support networks that may offer children a very wide range of alternative learning programs. Many colleges and universities accept homeschooled students, often letting them begin by taking a single course that, when successfully completed, opens the door to full-time attendance. Many post-secondary institutions offer correspondence and Internet-based programs, including learner-paced programs that allow formerly homeschooled students to acquire part or all of a post-secondary education that could actually open entry-level doors to numerous professions. Despite teachers’ unions opposing homeschooling, voluntary school attendance and learner-paced instruction, the number of alternative educational programs offered on CDs and via Internet-based programs has increased significantly in recent years. It is the nature of a changing economy to develop new technologies, including some that simultaneously terminate the need for certain traditional occupations while creating new occupations for which traditional educational programs offer no training. Interested candidates may purchase training programs on CD or access them online to learn new job skills at home and achieve certification through online testing. Over the past half century, the combination of market and social forces have slowly and imperceptibly driven the change that has been occurring in the world of learning, creating new learning programs that can provide education outside the traditional classroom environment. New, evolving technologies that require new training programs offered independently allows candidates to bypass traditional educational institutions in their pursuit of access to a career. Microsoft pioneered online testing of candidates for the MCSE (Microsoft Certified Systems Engineer) program and other industries have followed suit. During this era of electronic telecommunications, easy access to a wide range of alternative educational programs, and a declining birth rate, teachers’ strikes risk exposing the shortcomings of teachers’ unions and the government’s near-monopoly on education. Parents’ response to teachers’ withdrawal of their services reveals that government schools no longer hold anything resembling a monopoly on education. It exposes the sheer absurdity of governments engaging in forcible coercion such as compulsory attendance in a government educational institution, a legislative relic begun during the late 19th century under the Kaiser of Prussia for militaristic reasons. Prolonged teachers’ strikes that result in parents forming homeschooling networks runs the risk of children actually acquiring a valuable education. It also risks exposing the obsolescence of government education departments and the cadre of bureaucrats that they employ. The theoretical closure of Ministries of Education would challenge independent schools and homeschooling networks to educate children, but this is something they already achieve. Some teachers previously employed in state-run schools might need to become entrepreneurs and mentors in the homeschooling networks. The only things standing in the way of the evolution of education are governments and teachers’ unions, which will not let their Ministries of Education go quietly.